The saying goes, “home is where the heart is” but what about when the heart feels multiple places to call home? Is there only one true home? Leonard Foglia, director of Cruzar la Cara de la Luna (To Cross the Face of the Moon) touches upon a very important and relevant question in such a global society: where is home? Is it the country in which we’re born? Or the country where we live our lives? 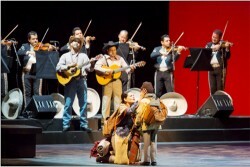 Cruzar la Cara de la Luna (To Cross the Face of the Moon) presented by the Lyric Opera of Chicago is an opera that follows three generations of the Velásquez family as they face questions of national and personal identity. It is an inspiring journey through which the characters uncover family secrets that leads them to an emotional and joyful reunion. Following their Lyric Opera performance, the opera will have subsequent performances at Benito Juarez Community Academy and in Waukegan. Director Leonard Foglia and actress Cecilia Duarte who plays Renata in the opera took some time during their Midwest performance to answer a few questions for Lawndale Bilingual Newspaper. Lawndale News: What was the guiding force for this fine arts production? Leonard Foglia: The initial guiding force was Anthony Freud, who is the head of the Lyric Opera. He attended a mariachi Vargas concert and called me the next day and said what do you think of creating a mariachi opera? The music is so emotional and powerful and I think we should use this style of music. I had been living in Mexico at the time, so I was very familiar with the style of music, and so it came to me to come up with a story that would have some meaning to the community and also a story I thought worth telling. LN: How can audiences whether Latino or non-Latino relate to this piece? LF: It deals with the notion of displacement and separated families. Before I even knew what the story was going to be, it all started with the notion of home and where is home? Whether you’re Latino or not, that is a very big question for people all over the world right now. We all travel a lot and we all very rarely end up working in the city where we grew up in. The notion of identity and displacement I think is a universal theme. It seems to be a longing for what they left and also embracing of where they are. 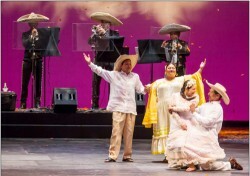 LN: What is it like to be a part of a historic moment for the Lyric Opera considering this production is the world’s first mariachi opera and Spanish-language work to be presented by them in their almost 60-year history? Cecilia Duarte: It is a big sense of pride for me; I can tell you that as a Mexican woman. I’m very proud and honored to be a part of a project like this that has united two very important audiences: people who come to opera and didn’t know anything about mariachi music and also people who have never been to an opera. So, it’s really big and really happy to be a part of this. LN: What do you hope audiences leave with? CD: First of all, that people that have never been to an opera are coming to see more opera and also that people that have never heard mariachi music they could be more into it. Second of all, that they get the messages of the story. I have seen the American people come to me and say, “I never thought there was a human side to the immigration issue.” I like to see that people are actually thinking of other issues and it is also good that we are talking about an issue like this in such an artistic way. If we move something in someone’s heart or someone’s brain then we have already done something, so I just hope that everything that comes likes it and thinks or feels about something.